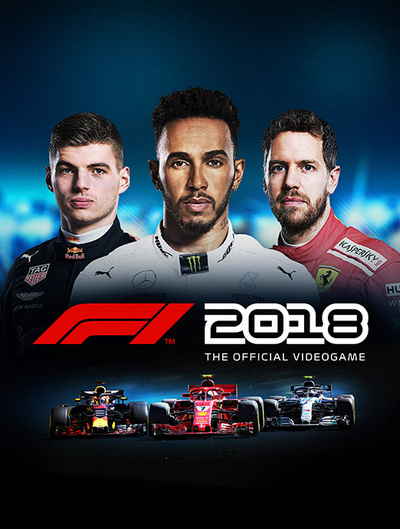 Just like every year, we get a new F1 game. 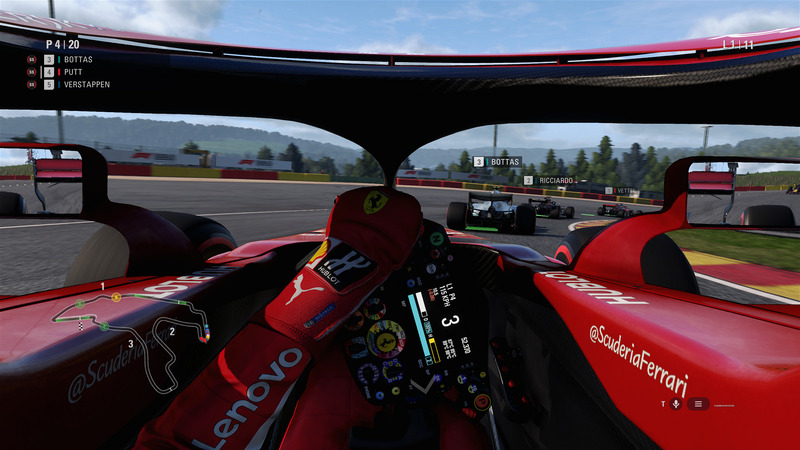 And just like I mentioned last year, Codemasters only has 12 months to develop these games. So it’s best to keep expectations on the lower side. But unlike last year, which saw a drastic change in the aero regulations that brought us wider tires and way more downforce, the regulations stayed mostly the same for this year. 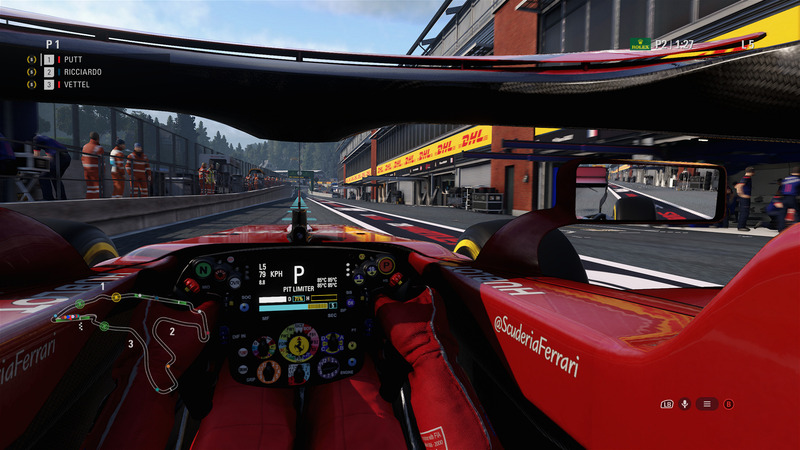 So we won’t see a big change in how the cars feel with F1 2018 compared to F1 2017. 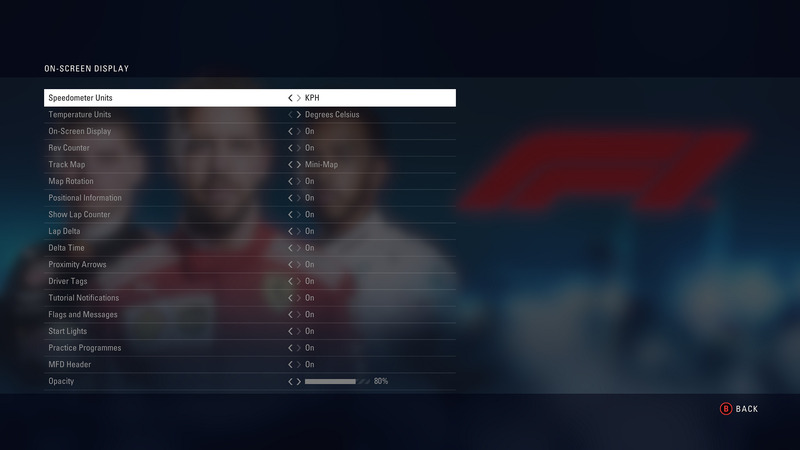 This years installment mostly expands on systems that were already present in last years game and brings along one feature I dearly missed since F1 2010. This woman will introduce you to a journalist. 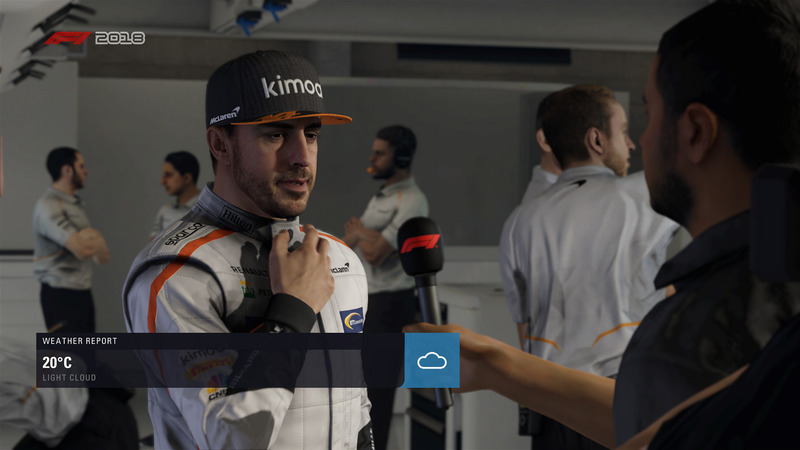 Yes, a journalist that’ll ask you questions about your practice, qualifying or race results. 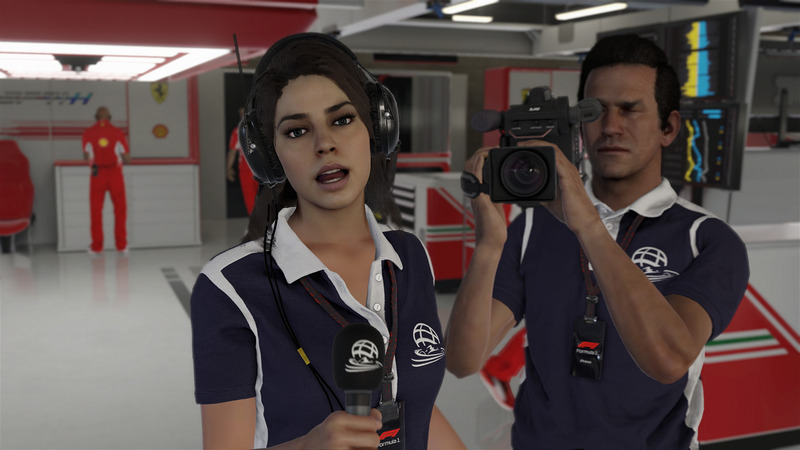 But unlike in F1 2010, the answers you give actually matter. 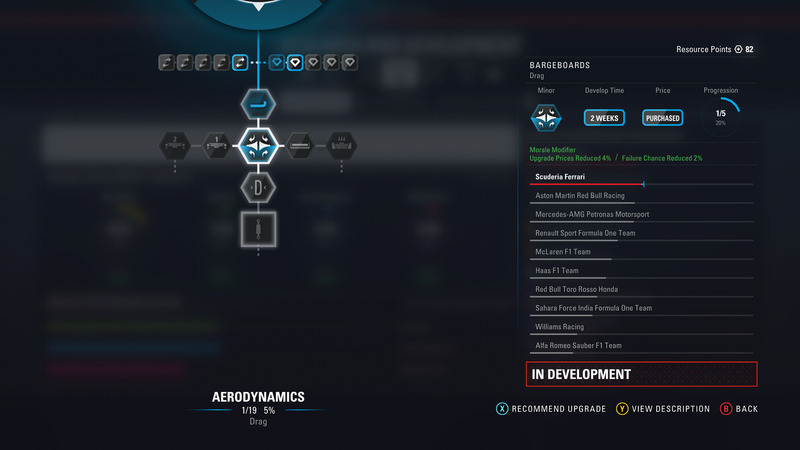 Will you praise the aero team by saying the car had sufficient downforce or talk down your entire team by saying they expected too much from you? Depending on your answer your standing with the affected development department will either decrease or increase. A good relationship will gain you a price reduction for upgrades and a lower percentage of failure. A decreased standing will of course do the opposite but there’s also the reputation with your entire team that’ll increase or decrease over time. A better reputation will give your contract a higher value. 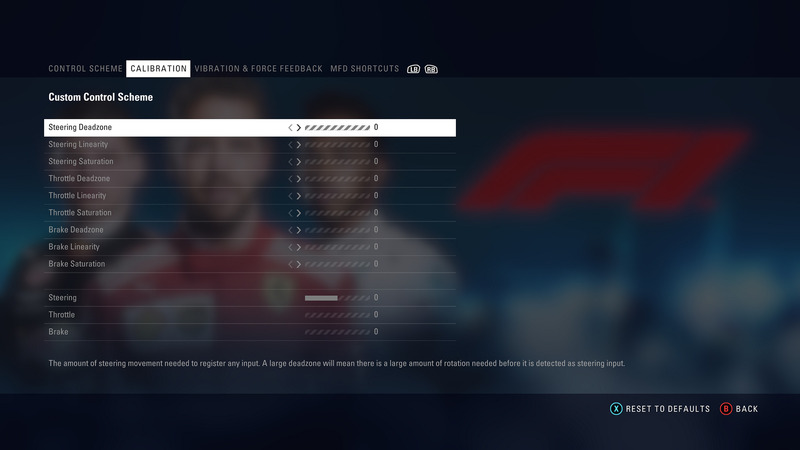 That’s a rather nice little addition to F1 2018 since a higher value gives you options to choose from various improvements like faster pit stops or higher resource point rewards after a race. You occasionally also get asked about your rival or teammate and depending on your answer you’ll either raise your ‘Showmanship’ or ‘Sportsmanship’ standing. 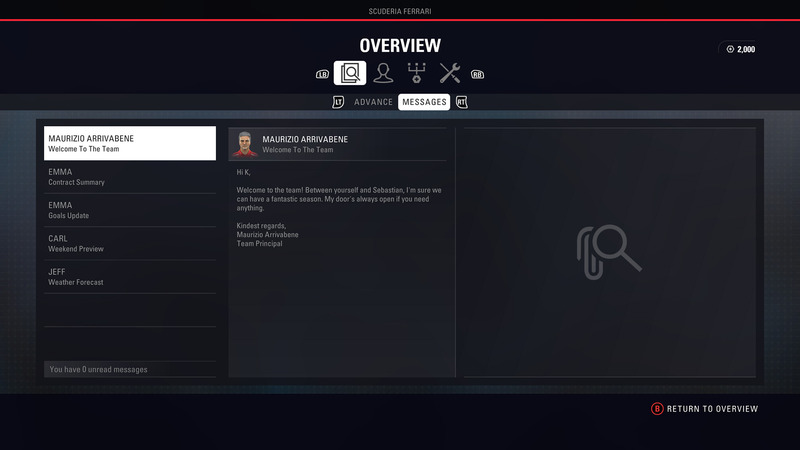 Those two stats will give you better chances at teams who are looking for either of those characteristics in a driver. 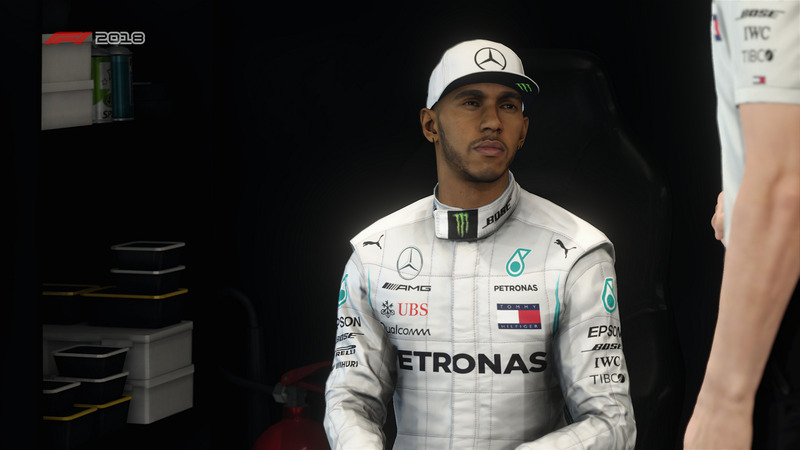 Now that the whole interview system’s out of the way.. we’re finally able to drive a car. Nothing much has changed here apart from the very obvious Halo device to protect the drivers head. 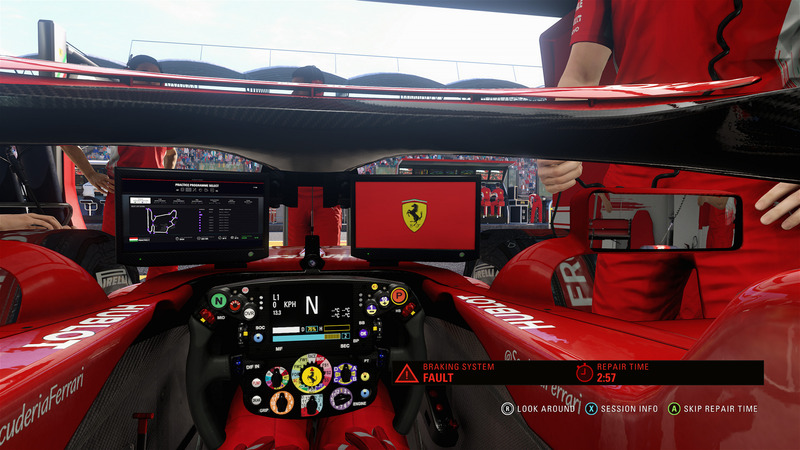 Luckily we’re able to turn off the pillar that’s right in front of the driver and i’d recommend everyone to do this if they prefer the cockpit camera. 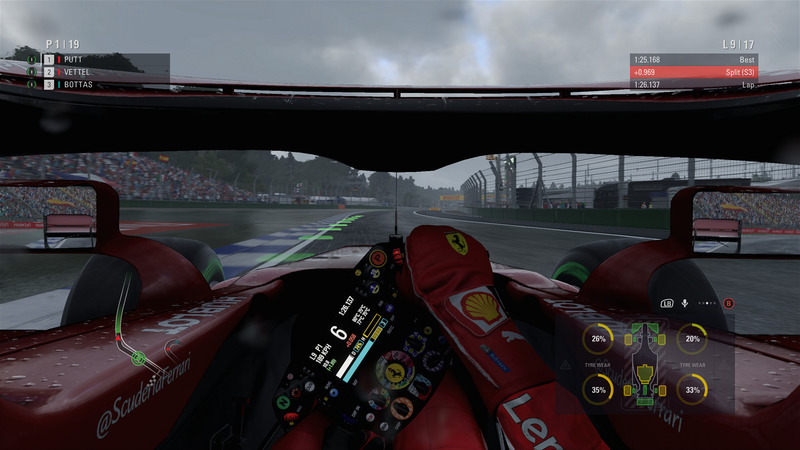 If mods will ever be able to completely remove the Halo device will be seen once the game gets into the hands of talented modders. 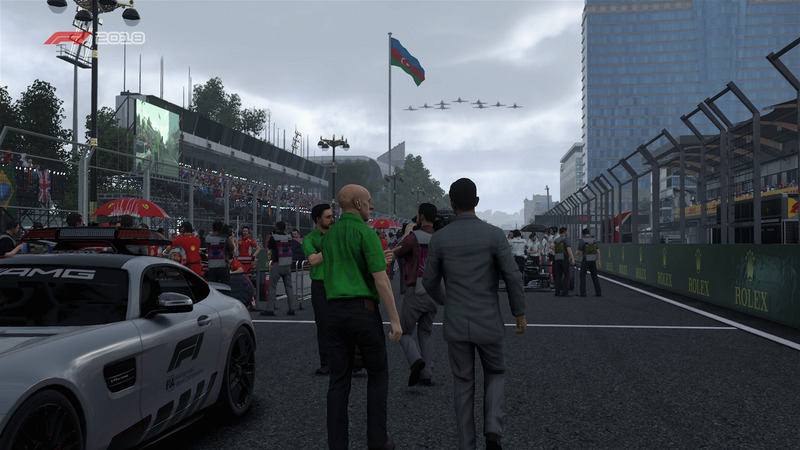 But judging by the lack of modified 3D models of previous F1 games, I highly doubt we’ll see such a thing happening. The next small change comes in form of ERS management. ERS, standing for Energy Recovery System, is the electric part of the F1 hybrid powertrain. You’re now able to control the battery power output to the engine. Be it either Off, Low, Medium, High, Overtake or the Hotlap option. You can change it just like the fuel mix option in the MFD (Multi Functional Display). Braking will refill the battery by harvesting kinetic energy and driving fast, which outputs a lot of heat that can be harvested, will also refill the battery. So you always need to choose between harvesting energy and lose some horsepower or using it to… well, drive faster. 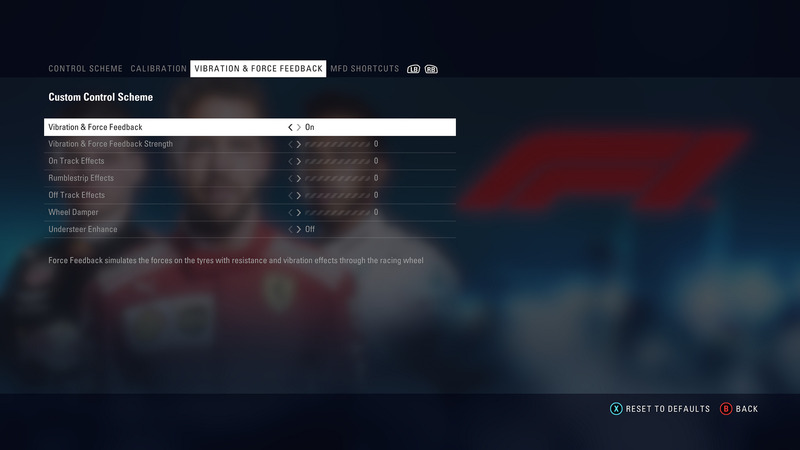 It’s not really intrusive however so i’m glad this system made it into the game since you’re not constantly changing this setting. There’s also an automatic option for when you don’t want to bother with this sorta stuff all together. 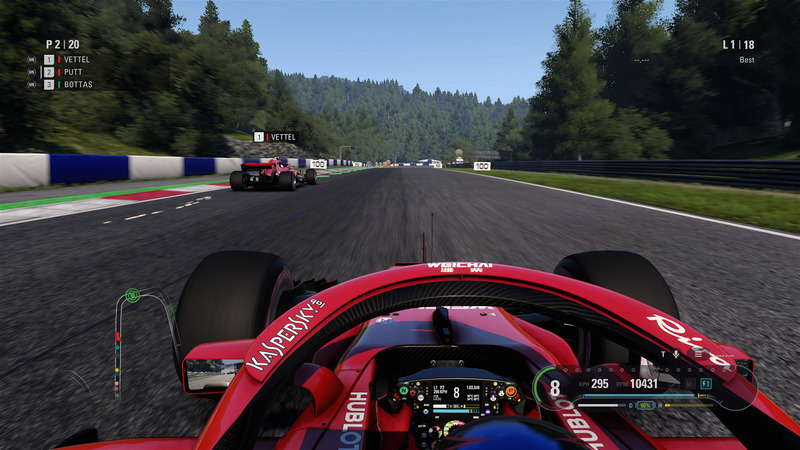 And I wouldn’t blame you because I do believe the AI in F1 2018 will give you a run for your money. Not giving you the preferable racing line or going through a turn wheel to wheel. They just seem more agile on track than in previous installments and aren’t easily giving up their position. Upgrades, Upgrades and even more Upgrades! The practice programmes are for the most part unchanged with the only difference being the addition of a ERS management program. This program is fairly easy to accomplish since all you have to do is drive fast while the ERS option is set to either ‘Low’ or ‘Off’ in the MFD. Once all the practice stuff is set and done, and you’re happy with your cars setup, it’s off to the qualifying and then the race. 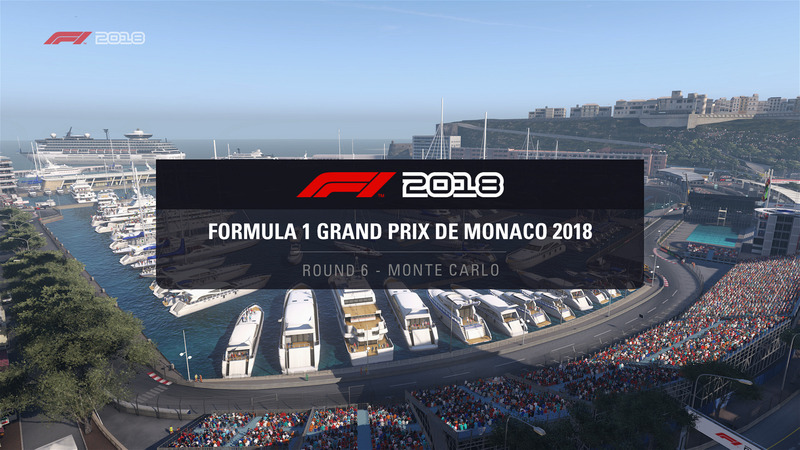 The game of course features all 21 racetracks from this season and then some variants for the different event challenges that have been introduced in last years F1 game. 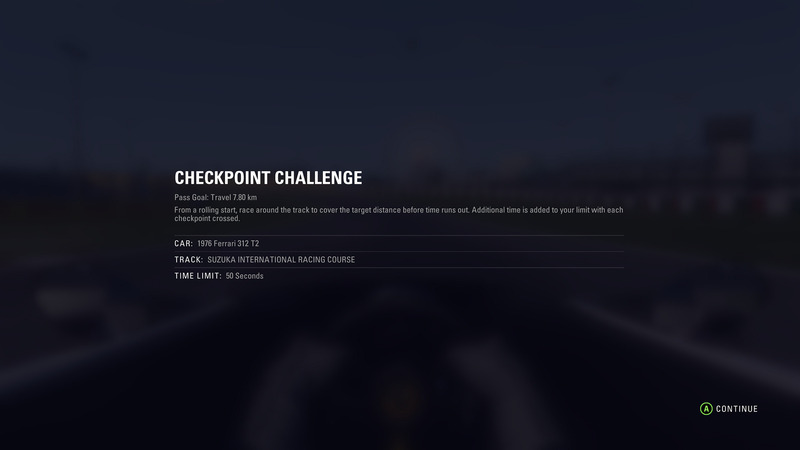 These challenges aren’t introduced via cutscenes anymore and just appear after every second or third finished race. Not really a bad thing mind you because seeing the same cutscene for the upteenth time gets tiresome after a while. However, having at least one cutscene to introduce these events again would’ve been nice nonetheless. Let’s not forget the upgrade system which has seen slight improvements over last years game. 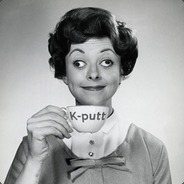 You earn resource points by generally being a good driver.. who would’ve thunk. 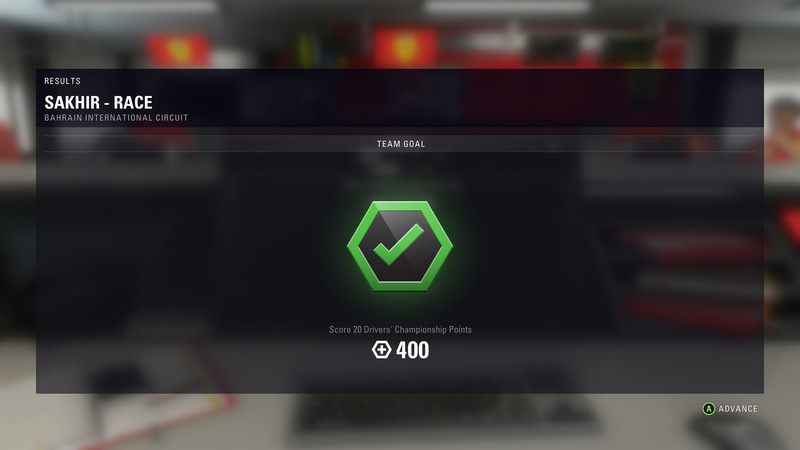 But also completing team goals will net you a huge bonus over the span of 2 or 3 races. 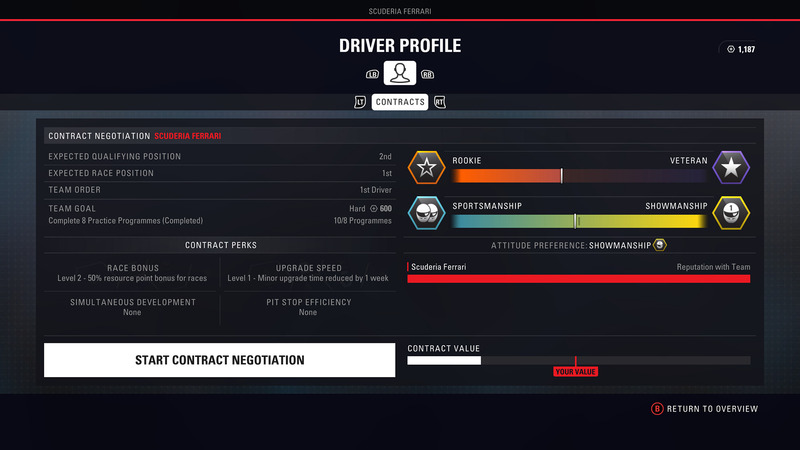 Add that to the already mentioned interview system that earns you favours like reduced upgrade costs with the various car departments. 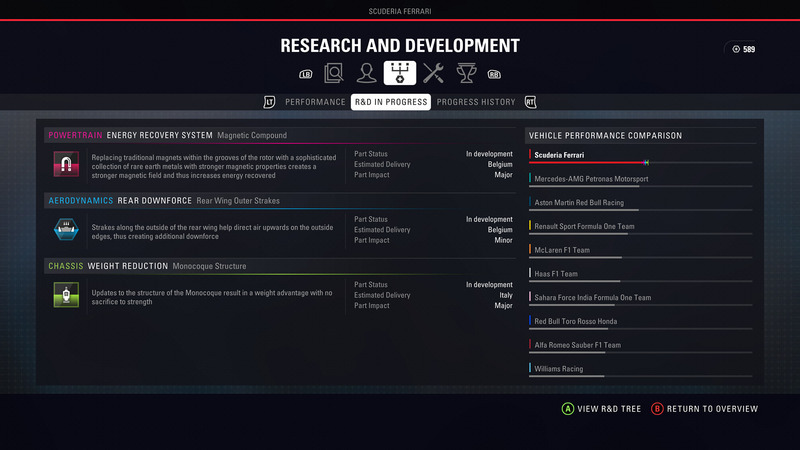 You’ll always be upgrading something in F1 2018 unlike in last years game where you generally never had enough resource points to do anything every few races. Most of the time these upgrades fail however. At least at the beginning of your career. So it’s best to focus on quality control upgrades which reduce the failure rate. Handling of the cars seems to have improved. At least in my opinion. 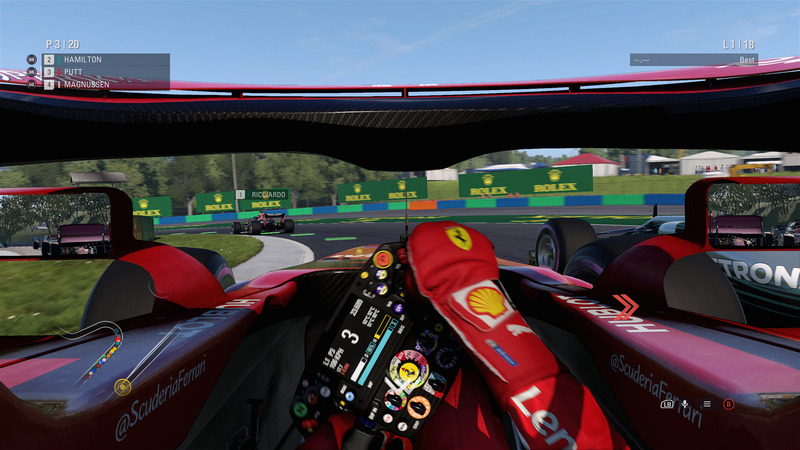 It always seemed that the cars in F1 2017 were rather planted at all times even with the traction assist being disabled. 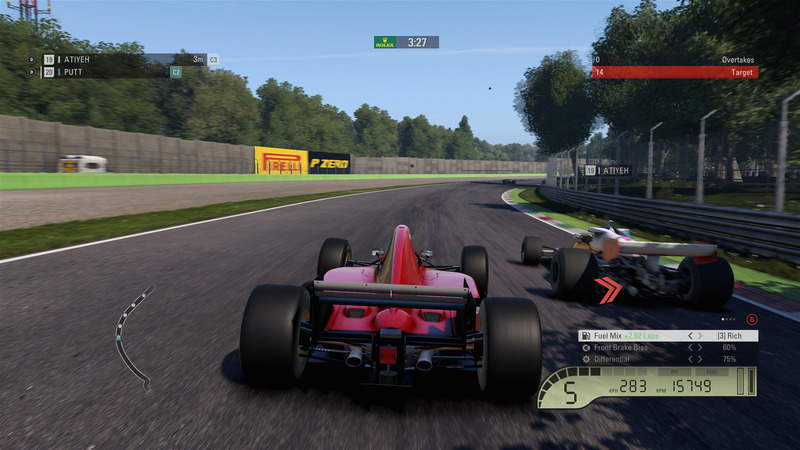 With the new game the cars fight against you at all times and seem generally more floaty at lower speeds. So driving these cars seems now more challenging but also rewarding. 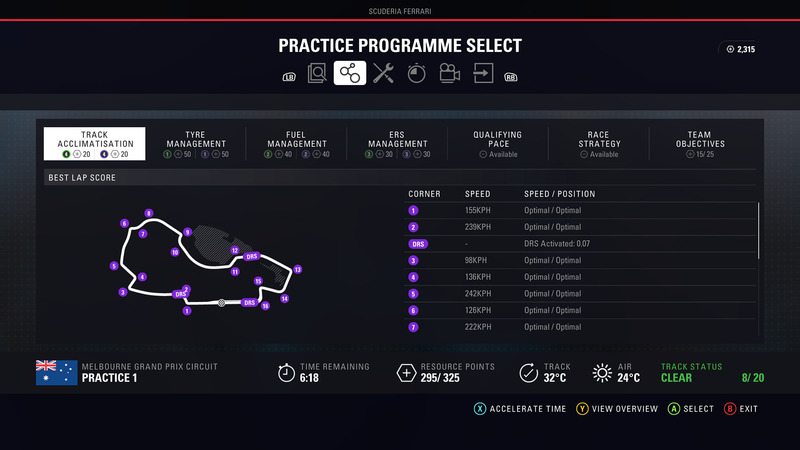 Using the practice program to get the right balance between downforce and drag seems to be more important than last year’s game. 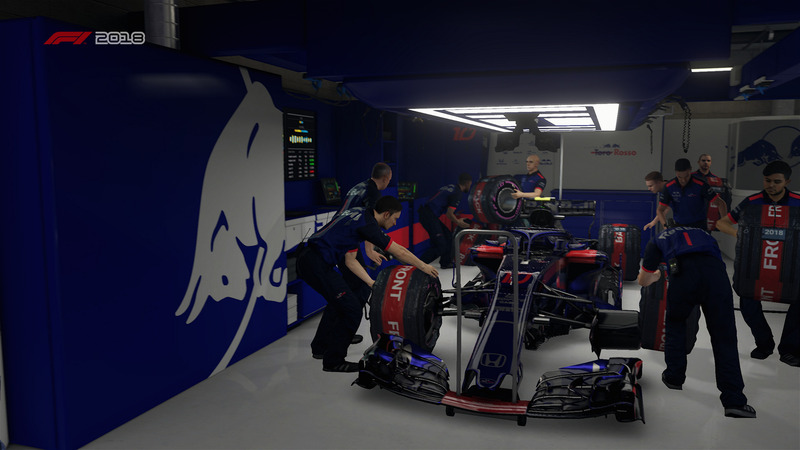 Not that it wasn’t beneficial to tweak your cars setup in F1 2017, but it feels like the changes you make on your car have a much bigger impact in 2018. 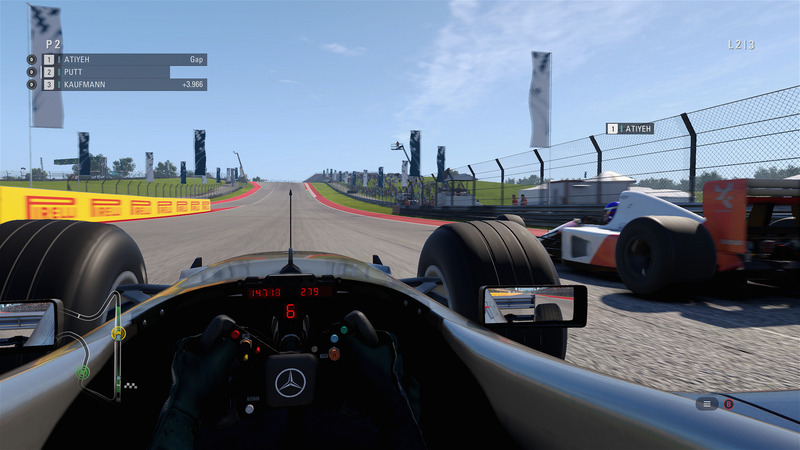 The tyre temperature model has gotten a small change as well. The brake disc temperature will now bleed over into the tyre just like the real deal. Drivers generally use the brake to heat up the tyres. There’s also a core tyre temperature now and keeping that at ~100°c is your ultimate goal to get the best grip from these big rubbery rings. Now, I don’t know if that’s just me, but I generally never had problems getting the tyres to these temperatures and rarely ever gave them much thought. 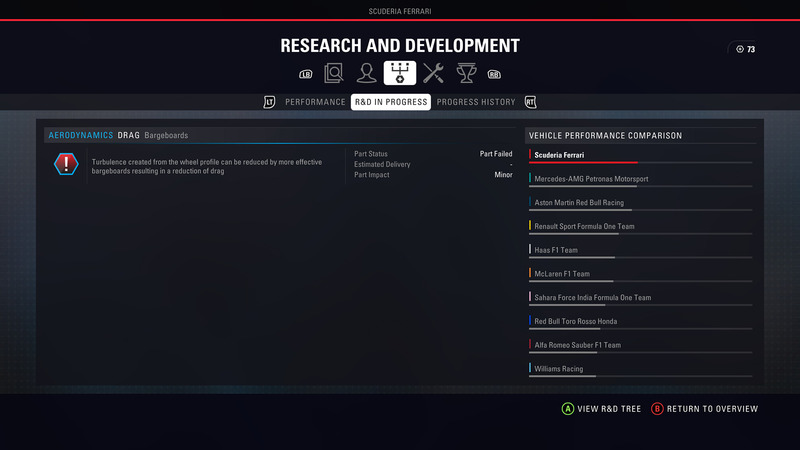 If you do however have problems handling your car on a specific race track, you can now ‘Simulate’ a race in your career. 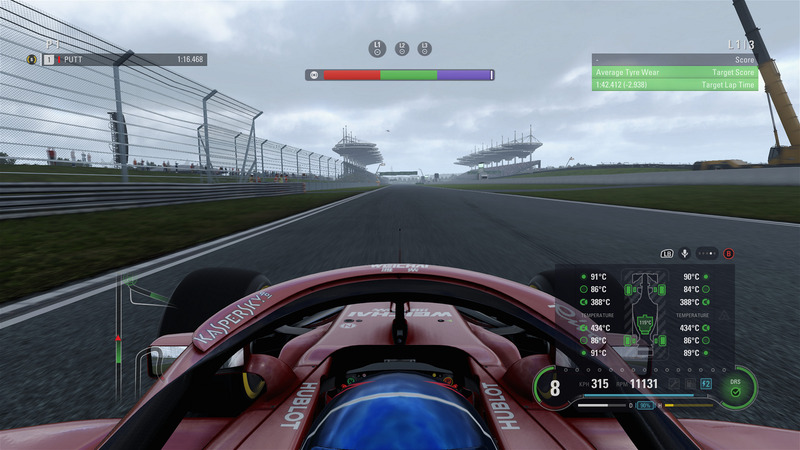 You still need to partake in the practice and qualifying but the race itself can be simulated. 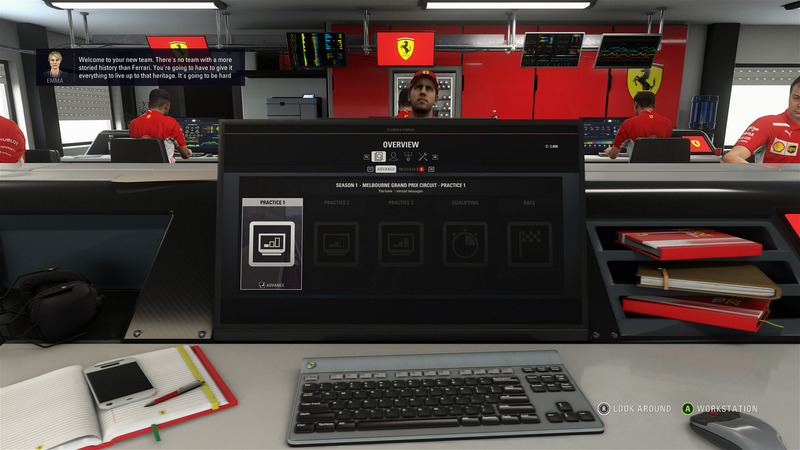 I’ve tried it on 2 races so far, and even in the best car with a pole position, my simulated alter ego only finished 6th or 8th in the race. That’s the penalty for not doing my job I guess. I’ve tried to join an online session, but this being a review copy weeks before release, I wasn’t able to find anyone to race against unfortunately. The included photomode can yield some rather neat results. Visually the game looks mostly unchanged to its predecessor. Just a tad more polished, perhaps. 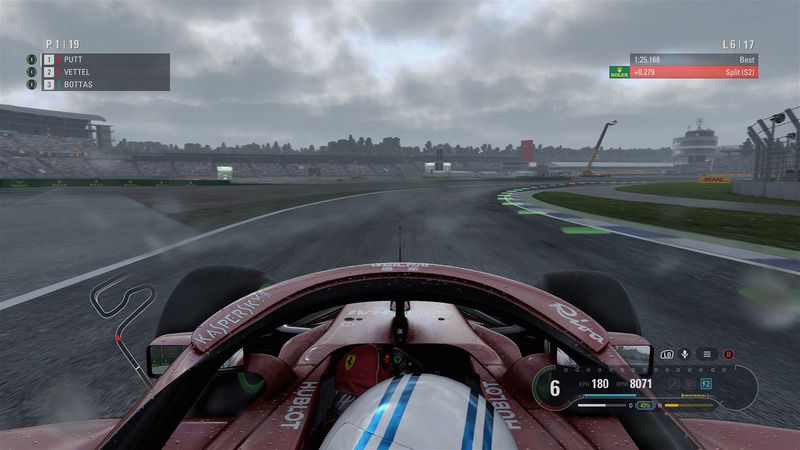 I did notice improved reflections in the rain for example. The odd pop-ins are still visible from time to time like a sign in Austria that’s completely grey from far away and suddenly loads in the proper texture when you’re way too close already. I didn’t notice many of those, but they’re still there. Not really a deal breaker of course but should be mentioned. Performance seemed ‘ok’ on my end. There are some strange frame spikes every now and then again that I can’t explain. The game suddenly stops rendering for 2-3 frames and then runs in slow motion for another 2 or 3 frames. 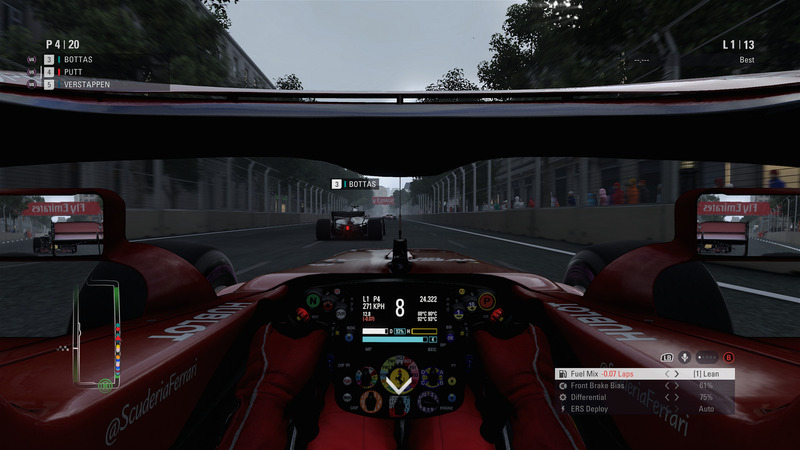 Of course that usually happens in corners or when I try to overtake… making me crash into the barrier or opponent. Updating to the latest Nvidia driver hasn’t fixed this problem unfortunately so hopefully a proper WHQL driver that ‘supports’ F1 2018 will fix it. The cutscenes still seem to be a problem for Codemasters engine. While my 1080 Ti has no issue rendering the race at 1440p and 60fps, the cutscenes give my GPU a kick in the chips. 99% GPU usage and ~40 fps just to render a driver getting out of the car is a bit much. These scenes aren’t really interactive of course so it’s not a huge problem. These performance hungry cutscenes aren’t a new problem however and have been with the series for quite some time now. 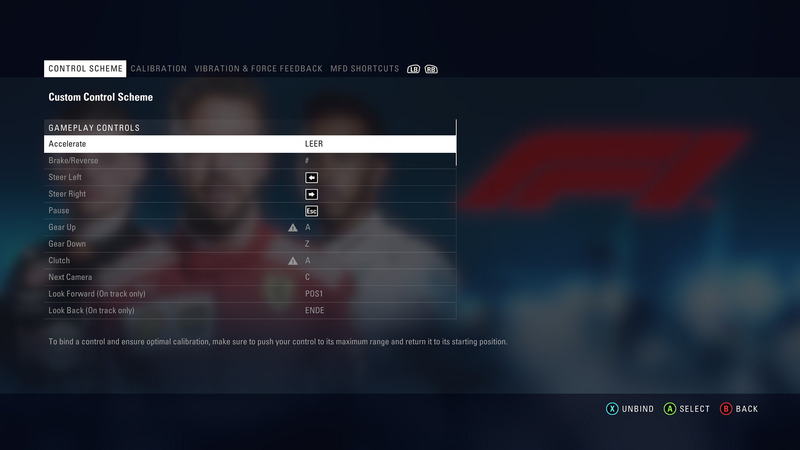 The options menu is still state of the art as is tradition with Codemasters games. Plenty of options to suit your preferences and PC setup. Don’t like motion blur? Turn it off or adjust the strength. 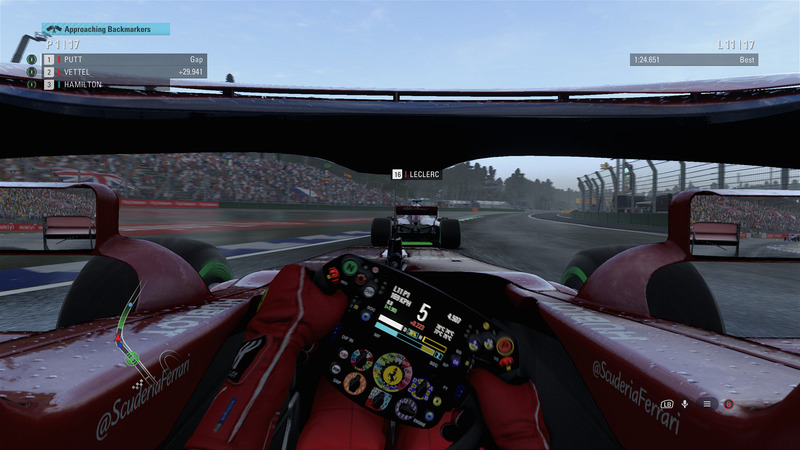 Want your cockpit camera 5cm higher up, more FOV and closer to the wheel? 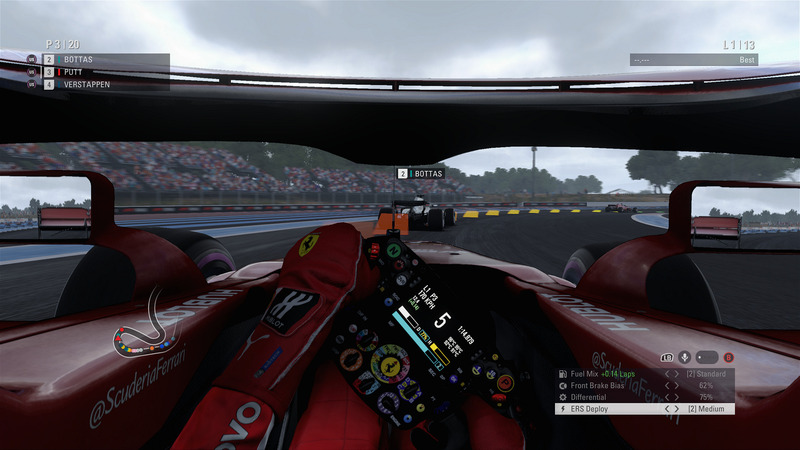 Well you can adjust that too in the camera options, as well as disabling the Halo center pillar. HDR (scRGB) support comes with the PC version too and is adjustable by a peak nits option. All in all a great version of F1 2018 with only minor problems which will most likely be fixed till release or shortly after. 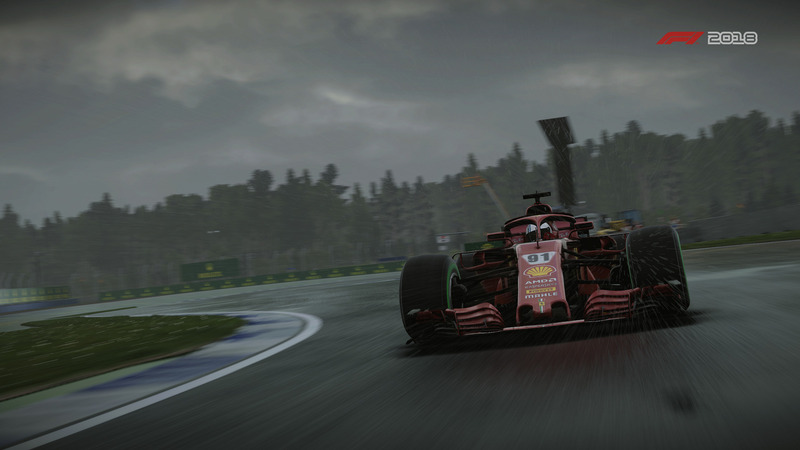 If you’re a fan of Formula 1 like me, you’re always looking forward to the next F1 game once the new season starts. 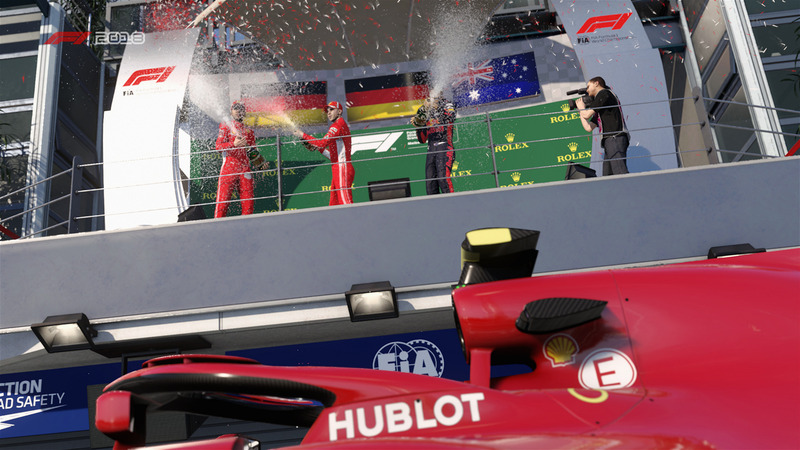 And this year was no exception, especially after the fantastic game that was F1 2017. However, not a whole lot has changed since then. 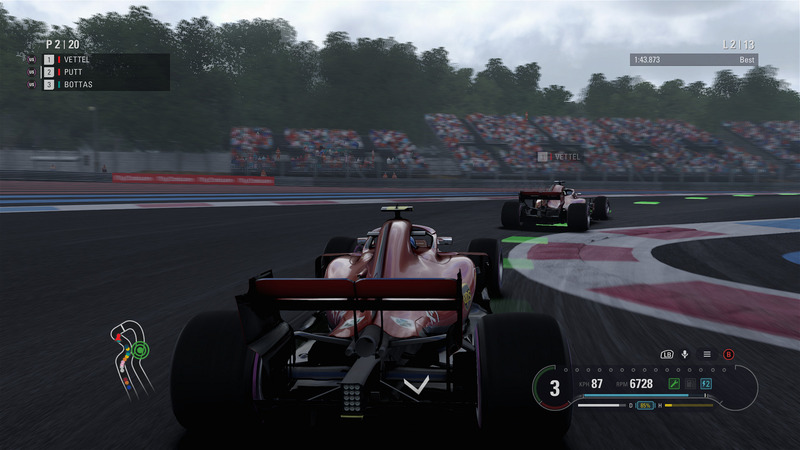 F1 2018 seems like a small evolution to last year. 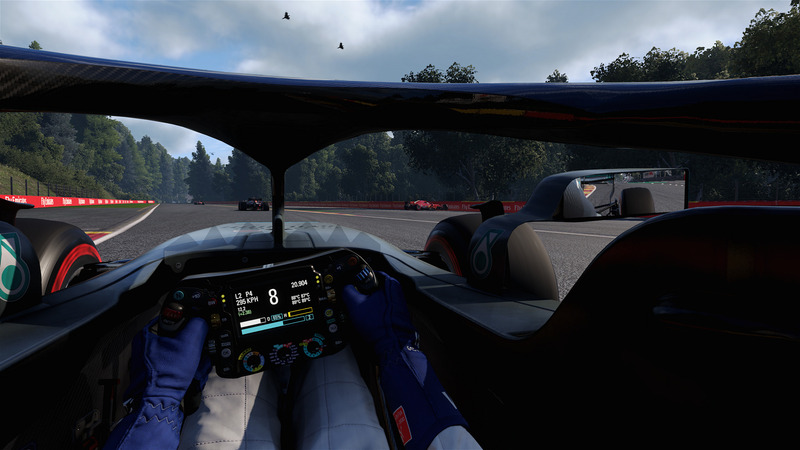 Polishing up gameplay mechanics that have been introduced in 2017, as well as refining the cars handling models. So if you’re not a crazy F1 fan that always needs the most recent version because of new drivers, car liveries, racetracks and already own last years game, maybe you should wait this one out till it’s a bit cheaper. 60€ seems a bit steep for these small, but worthwhile, updates. 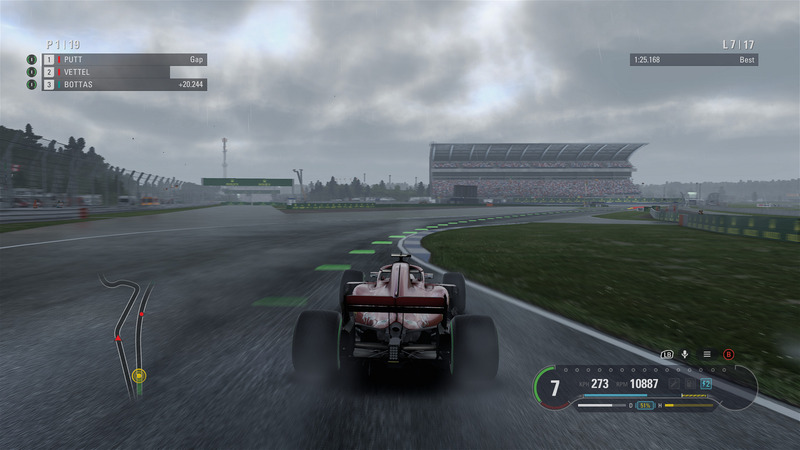 However, on its own this is a great Formula 1 game. And most likely the best to date. Handling: Cars are a treat to drive. Always fighting back to get the best of you. 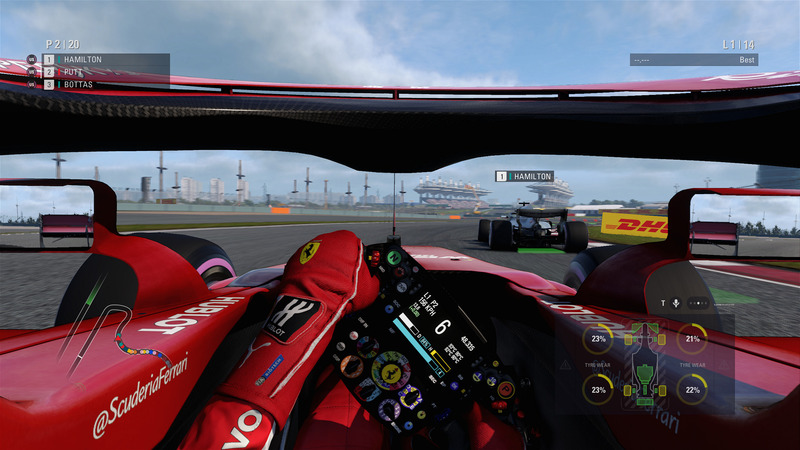 Career: The already great career mode got even better this year. 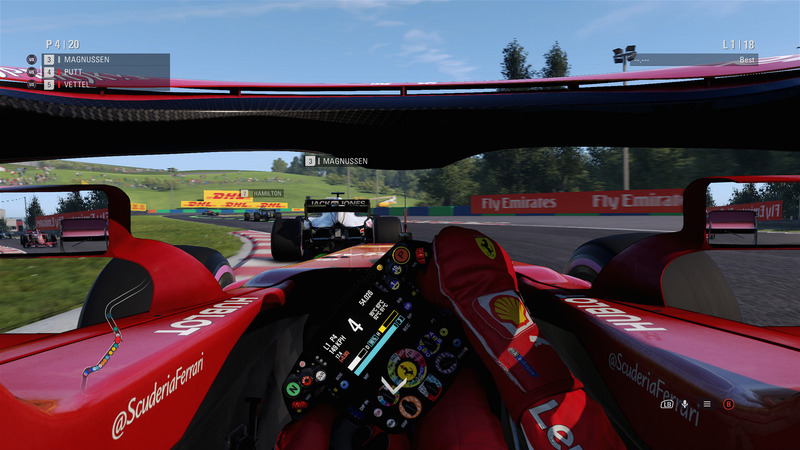 Features: F1 2018 doesn’t bring a whole lot of new things to the table, but rather refines what’s already there. 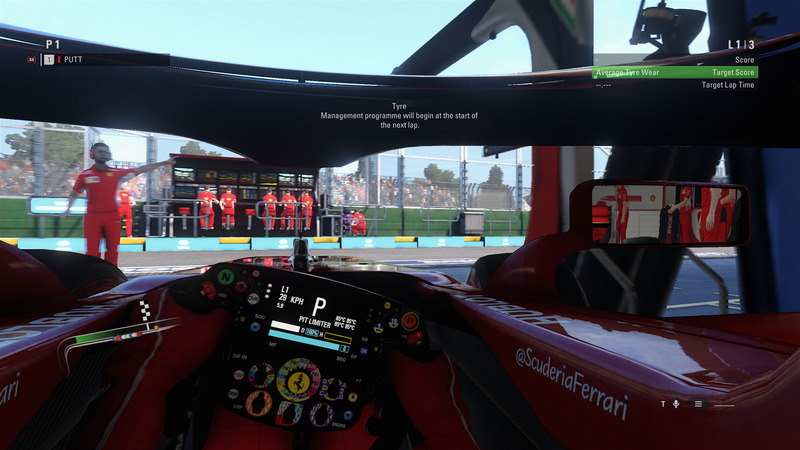 Halo: While the Halo can’t be completely turned off, the pillar right in front of you can be disabled. 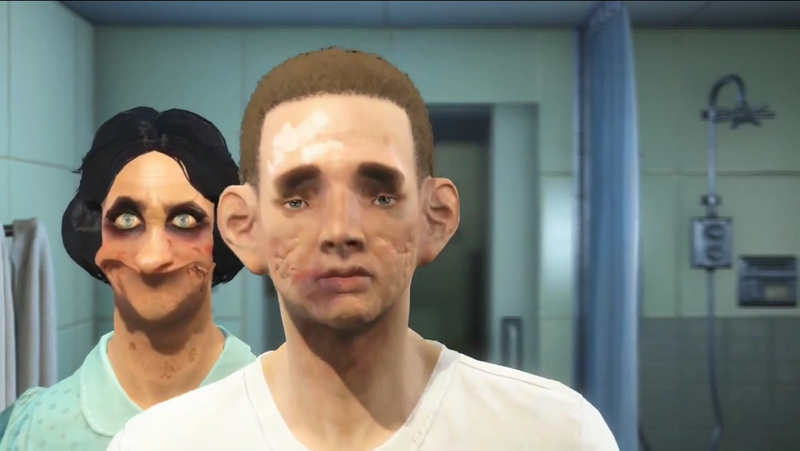 Character Creator: It’s still the character creator that’s been with the series for many years. Faces: People look stiff and oddly animated at times. Great successor to an already fantastic game. 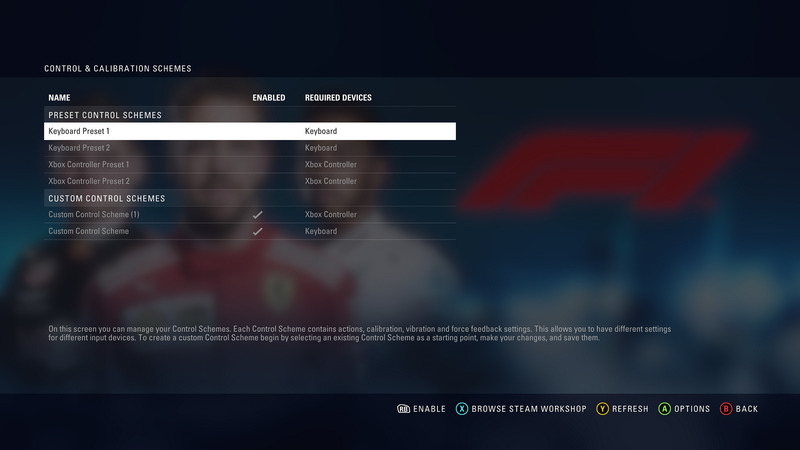 Settings: Yet again probably one of the best options menu in any PC game. Whatever you need changing can most likely be changed on the fly. Audio: An abundance of options to suit your needs. Even going so far in letting you choose the output device of the radio messages. Like a PS4 controller for instance. 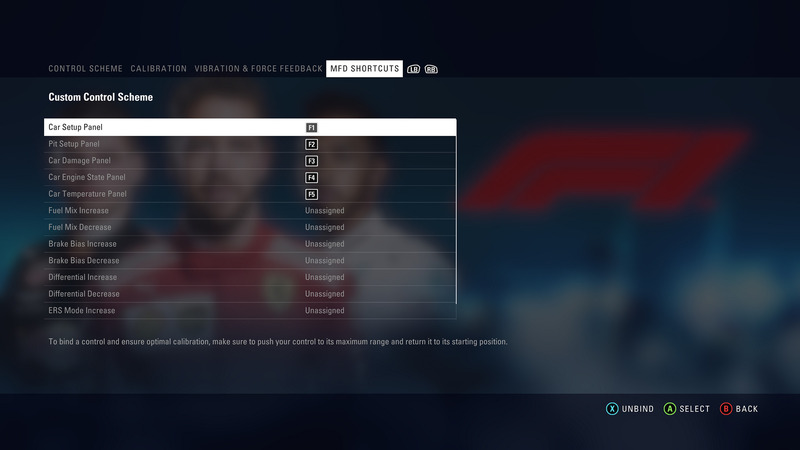 Controls: Just like last year, the list of supported wheels is vast.. ( http://blog.codemasters.com/f1/07/f1-2018-supported-wheels-and-controllers/ ) The trigger vibration motors on the Xbox One controller are also supported again. 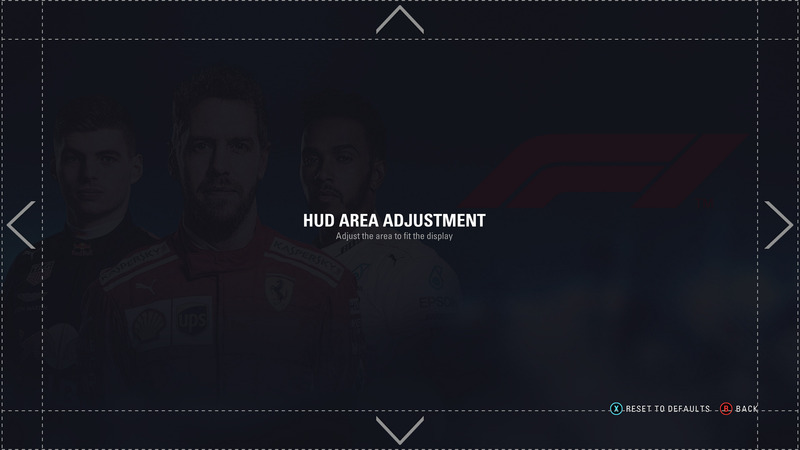 Adjustments to the steering ‘vibrance’ or deadzones are also onboard. 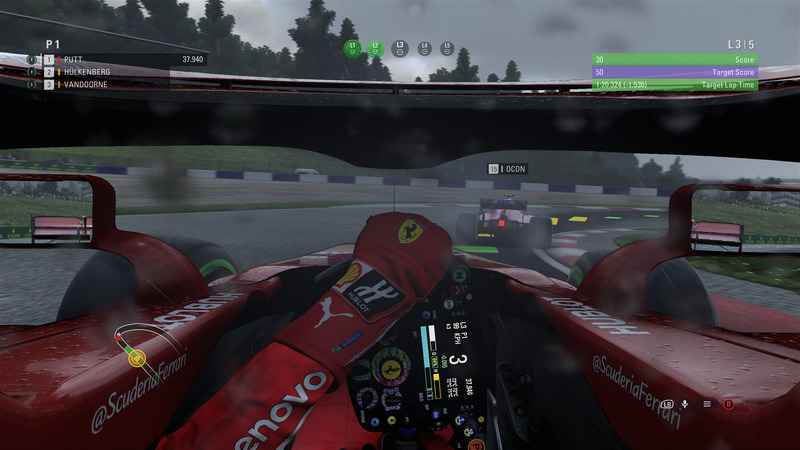 F1 2013 – Rush To See Rush Car!